With the Easter just around the corner, it’s time for us all to figure out what we’re going to spend the day doing. We’ve compiled an egg-citing list of things to do for Easter in Stockton, California for the entire family to enjoy. Visit your nearest Stockton, California Community Center to enjoy fun, free family activities on April 13. Make sure the kiddos bring their baskets as they are prepared to uncover nearly a thousand hidden eggs at one of four community centers in the Stockton area. Learn more. Some of our favorite memories are decorating eggs with our family, and what better way to celebrate Easter than with a fun Easter egg decorating at Shades of Color Paint Studio. Learn more. Bring a chair and dress warmly for the Stockton Citywide Easter Sunrise Celebration Service on April 21. This annual event commemorates the resurrection of Jesus Christ as One Church under the canopy at Weber Point Events Center. All are welcome for an hour of music, art, and scripture. Learn more. Even April showers can't get in the way of some good ol' fun! Sherwood Mall will host an Easter Egg Hunt inside their facility on April 13, and there is even a chance to meet with the Easter Bunny. The event includes kid-friendly activities, fun prizes and a chance to win one of six playful Easter Baskets. Learn more. Hop on over to ones of these excellent Stockton shopping centers and get your picture taken with the Easter Bunny. Photo purchase and reservations normally not required to visit the Easter Bunny. The Easter Bunny is hopping his way into McCaulou’s Department Store at Lincoln Center! Visiting the bunny is free and don't forget to snap a photo and hashtag it #VisitStockton to capture the memory! Visiting hours may vary click here to learn more. 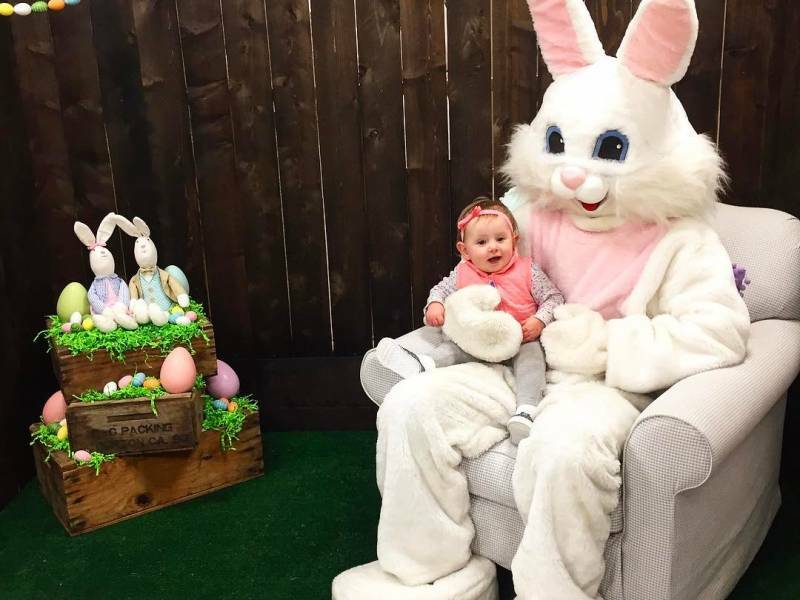 The Easter Bunny is in his spring garden at Weberstown Mall, and will be available for photo ops with children until April 20. Visiting hours may vary click here to learn more. It's not too late to make Easter brunch reservations at some of Stockton's best restaurants, if you hop to it. Kick off the morning—pre-Easter egg hunt, of course— with these fine establishments serving Sunday Brunch! Step into this chic, upscale lounge located on the Miracle Mile. They'll be serving an extended brunch on Sunday, with a special Easter Brunch selection. Call (209) 462-5283 for menu and reservations. Not only does Bud's provides an ideal seafood dining experience for its patrons, the restaurant serves an amazing and tasty weekend brunch spread. Call (209) 956-0270 for menu and reservations. This buzzy spot in Lincoln Center is open for brunch on Sunday, but seating will be limited, and will feature a special Easter dish. Call (209) 932-8001 for menu and reservations. This New Orleans-inspired gem serves crepes both savory and sweet. Tables for Easter fill up quick at this Stockton brunch hotspot, and if you book early enough, ask for the shaded breezeway for an outdoor dining experience. Call 209-941-9070 for menu and reservations. Head over to Mile Wine for a beautiful brunch spread with a little something for everyone to enjoy--yes, even the pickiest little eaters. Call (209) 465-9463 for menu and reservations. If you have a large party in town, then the Delta Bistro & Lounge is your best bet! The Bistro offers an annual Easter brunch menu with all the fixings for a tasty springtime meal on its spacious indoor or outdoor table tops. Call (209) 323-3085 for menu and reservations. Of course, these are just some of the ways to make the most of Easter time in Stockton.